Get ready for autumn as fires specialist, Dimplex, is offering one lucky reader a stylish Evandale Opti-myst electric stove and matching hearth pad worth £500! For those wanting the mesmerising appeal of a wood-burning stove paired with all the hassle-free benefits of electric, Dimplex’s Opti-myst technology is the most realistic flame and smoke effect you will see in an electric fire. Whether it’s chilly outside or you just want to cuddle up in front of a fire, once your room has reached a comfortable temperature, the impressive flame effect can be used independently of heat, meaning the calming feel of a cosy log fire can be enjoyed all year round at just the flick of a switch. 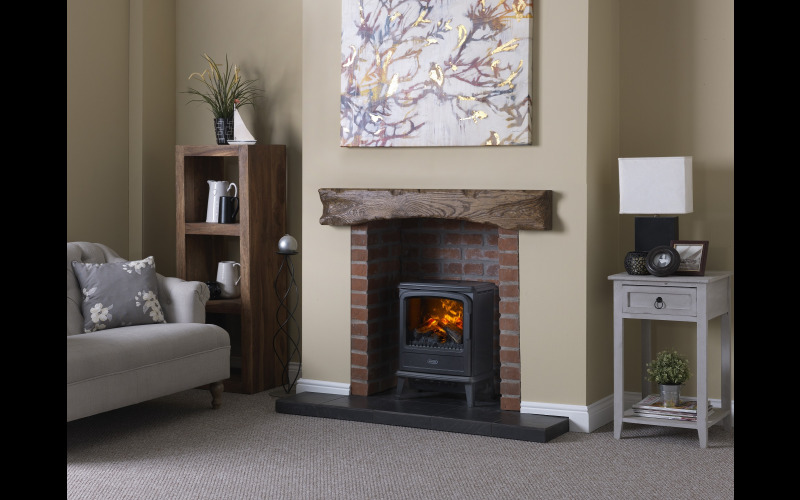 The Evandale stove features a matt black finish and comes complete with a realistic log fuel bed and Opti-myst® flame and smoke effect technology. The classic stove comes with a choice of two heat settings which can be controlled via a remote control. What’s more, installational couldn’t be easier, you just simply plug in and enjoy. To complete the look, you’ll also receive a Dimplex slate effect Hearth Pad for that finishing touch.